Tilbury’s London Container Terminal (“LCT”) announces that Streamlines’ new BLUE STREAM weekly service will call at London’s major port from February, as part of a new service linking Northern Europe to and from the Caribbean, Central America and Florida. 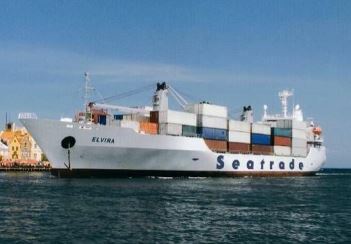 Streamlines, which is part of the SeaTrade group, is a niche container line which operates in the Caribbean, with a strong focus on perishable cargo, and has launched this new service as part of their development plan. The new Blue Stream service will commence in January 2016 from North Europe and arrive for its inaugural call at Tilbury on the 12th February 2016. This rotation will prove to be one of the fastest Caribbean links to the UK. Central America: With calls to Puerto Cortes in Honduras and Santo Tomas de Castilla in Guatemala, and offering a transit time of just 14 days from Central America to Europe, and the only one direct to UK, this service will be second to none on its offer to our clients. In addition, BLUE STREAM Service will serve Central America to Florida in just 3 days transit time. This service will also be able to serve for the import cargo from Europe, including UK, into Central America. In addition, from Rotterdam we will be offering connections to many other destinations, such as in Scandinavia, the Baltic and even to Spain and Portugal. Florida: Subject to pending US regulatory approvals, currently under process, StreamLines will offer the fastest service to the UK, with just 14 days into Tilbury, against 23 days offered today by the only direct service in the market. BLUE STREAM service will also connect US exports to Northern Europe via Rotterdam, and to France via Radicatel. French West Indies: In continuation to what was until now our Seaban service, StreamLines will now add calls to the port of Fort de France in Martinique, making our BLUE STREAM Service capable to go beyond from our current offer to Pointe a Pitre in Guadeloupe and Philipsburg in Saint Martin. The transit time from Radicatel (Le Havre area) will be of 10, 11 and 12 days respectively.